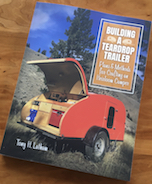 Teardrops n Tiny Travel Trailers • View topic - Good fiberglass/epoxy instructional videos? Re: Good fiberglass/epoxy instructional videos? Be sure to hit the galley however. In case of hatch leaks. Rain while the hatch is open, etc. I've had minor water intrusion in the cabin. Much more in the galley. Fiberglass cloth can prevent plywood from checking. Good marine plywood, usually with Okume veneer aren't prone to checking and can be sealed with just epoxy - cloth is not needed. 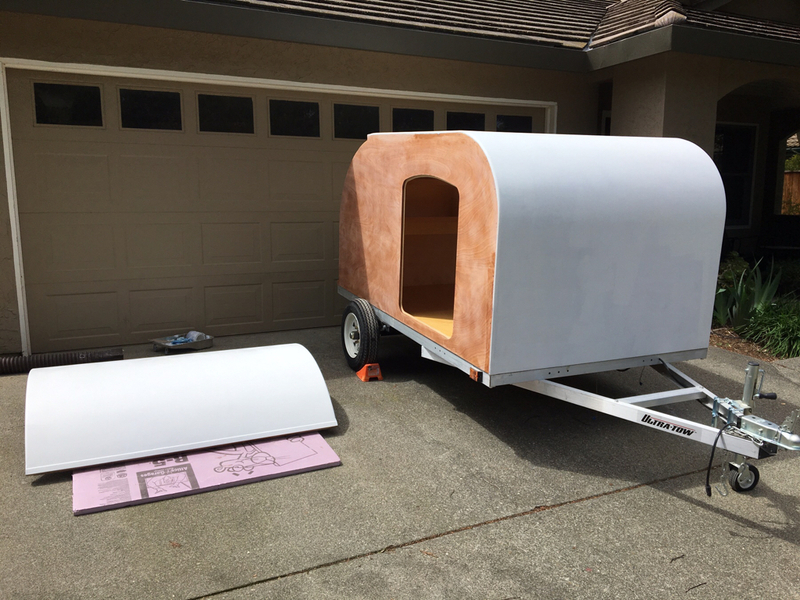 I used Okume for the walls and Baltic birch for the roof. 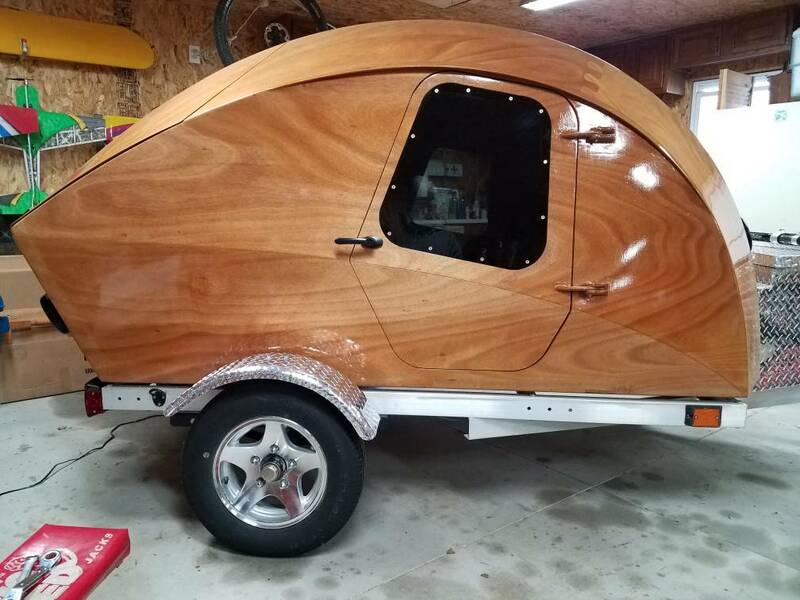 I built the trailer and used a 1/2" radius bit to round over the edge. I laid 4 ounce glass cloth on the top and let It drape over the sides. I applied West System epoxy over the cloth and once it began to harden I trimmed the edge. Unlike polyester resin epoxy fully saturates the cloth. I applied epoxy to the marine ply sides, no cloth. I painted the roof and used marine varnish for the sides. The inside is varnished. I epoxy the floor of my galleys since they are built around a Reliance water jug that has the potential to leak. I don't think fiberglassing is needed back there but I use Fredrick's method for sealing the hatch. rkanz wrote: Good marine plywood, usually with Okume veneer aren't prone to checking and can be sealed with just epoxy - cloth is not needed. I tend to disagree (politely) with this statement. Not so much from my own direct experience, but more from the logical interpretation of the experiences of others here. Let me explain. Wood grain tends to run predominantly in only one direction and the little tubular strands of lignin (wood cells) tend to hold moisture like a straw. When the wood cells swell they expand mostly across the width of the grain (not as much lengthwise), so the micro spaces between grains close up. Not necessarily from exposure to weather and more moisture, but just from temperature changes and mechanical stresses... bouncing down the road and such. When the wood dries and the straws shrink (or the stresses are relieved) the micro spaces open. 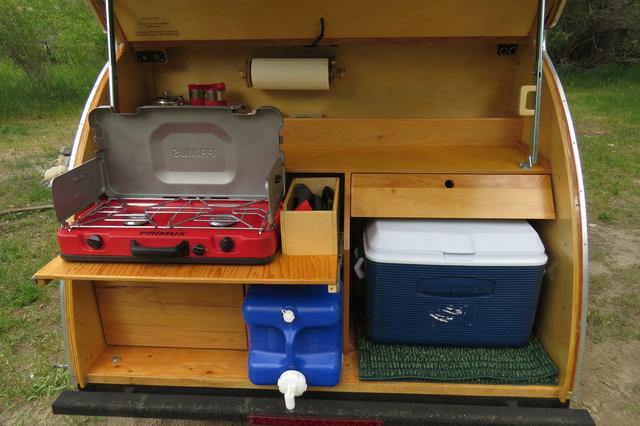 Add any sort of bending that puts extra strain on the spaces between the fibers, such as rolling plywood around the profile of your camper "the easy way", and the chance of these gaps opening up... small as they are... increases. Now a good flexible paint might be able to handle these cycles for a while, but the paint won't stay for ever and may not be able to handle all that we are asking of it. Your typical woven fiber glass cloth, on the other hand, has fibers running in opposing directions, and these fibers don't stretch very much at all compared to wood. They are, however, in their natural state, flexible (which, conveniently, greatly enhances their ability to conform to various shapes), and vulnerable to mechanical damage (mostly snags and upsetting of the weave structure). Epoxy by itself is actually somewhat brittle and, therefore is not very strong when subjected to stresses (bending, stretching, etc. ), so by itself does not do much more than paint. However, when you combine epoxy resin and glass cloth together... something magical happens (poetic exaggeration for effect ). You get a composite. A composite where the sum of the parts is greater. The strong little glass fibers are now locked into position and become much more structural in nature, reinforcing the epoxy and keeping it stable; while the epoxy still performs great as a sealer and armors the glass weave against upsetting. On the other hand, once you step up to cloth, you are going to spend more... time and money... on resin (and for non-woodies, fillers to fill the weave) and to seal it, than just painting on epoxy; but much of the expense is in the resin, so why not use the cloth, too? On flat interior surfaces are for protection under outer aluminum skins, I would think (and certainly trust Tony's experience) that straight resin is a good sealer coat. I'm just saying that 'you pays your money and you takes your choice'. Epoxy is good. Composite is better. Last edited by KCStudly on Sun Feb 04, 2018 1:32 pm, edited 1 time in total. My camper is built like a boat in that all surfaces were covered with epoxy. It is completely encapsulated. The outer surfaces all have fiberglass in the epoxy and were varnished after. To give you an idea of cost. Close to a $1000 of my build or around 25% of my budget was in glass and coatings. I wouldn't have it any other way. Quality products are worth it.